My guest in this special episode of the podcast “Leadership is the Competitive Advantage” is Pia-Maria Thorén, a leading expert in the field of Agile Leadership, and specifically in Agile HR. Pia-Maria is the founder and owner of a consulting and training company GreenBullet that specialises in Agile HR and Agile leadership. She has worked as a consultant with many of Sweden’s largest companies, helping them to implement HR processes and solutions, always spiced with an agile mindset. She is also the founder of Agile People, a network and a conference with the purpose of spreading the agile mindset in organisations. 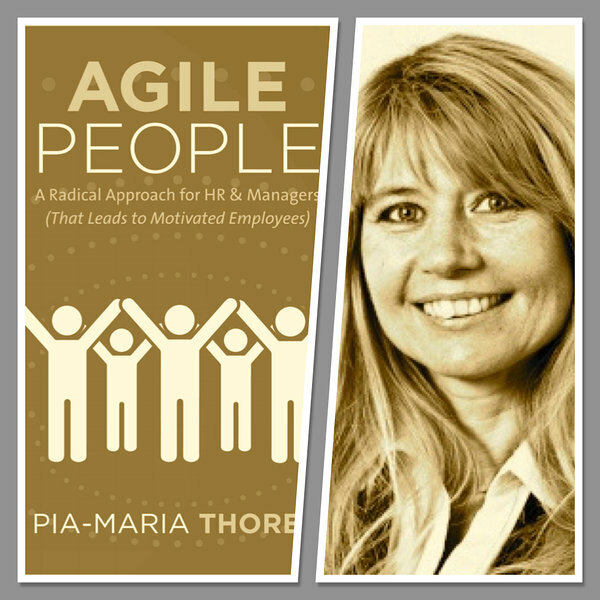 In addition, Pia-Maria has recently written a book called “Agile People: A Radical Approach for HR & Managers (That Leads to Motivated Employees).” The book draws on ideas from agile software development and shows us how they can be applied far beyond just the software industry. I am really glad that Pia-Maria will join us at the Estonian Human Resource Management Association's annual conference this spring as one of the keynote speakers. # I believe in psychologically safe workplaces. A couple of years ago, Google published the results of a comprehensive study that gathered information from hundreds of Google’s teams to figure out why some teams stumbled while others were really successful. The research indicated two behaviors that all the effective teams generally shared. First, team members in the successful teams spoke in roughly the same proportion, a phenomenon the researchers referred to as ‘equality in distribution of conversational turn-taking.’ And second, successful teams had high ‘average social sensitivity’ — they intuitively grasped how others on the team felt based on their tone of voice, their expressions and other nonverbal cues. These two broad behavioral aspects – empathy and sensitivity – are combined into a phenomenon known as psychological safety. Psychological safety is a team climate characterised by interpersonal trust and mutual respect in which people are comfortable being themselves. There were also a handful of other aspects that were discovered as contributing to the success of teams, but if the psychological safety was not present then all other aspects did not really matter at all. That is why psychological safety is the number one trait of high-performance teams. Now, if we are talking about the low levels of employee engagement and productivity, then one of the reasons teams are struggling is that more often than not we do not let people be themselves at work. People put on a mask when they park outside of the office in the morning. And then they enter the building and they have this mask on the whole day until they leave the building in the evening. Then they can remove the mask again and be themselves. Most of the time people are too busy managing impressions, instead of being their authentic selves and saying what they really think. And this has a lot to do with psychological safety. As a leader, you should foster empathy and sensitivity by adopting leadership practices and tools that encourage confidence, honesty, trust and ultimately psychological safety within the team. PS! You can learn more about Pia-Maria and her work on her website.